IPL Season 12 Auction is finished and we all are eager to know about the IPL 2019 Schedule and venue. And we also wonder about the top IPL Ranking Players. So Here is the list of all IPL players ranking like Ranking of batsmen, bowlers, ranking all-rounders in IPL. Ranking of players considering all season of IPL which is IPL 2008 to 2018. Firstly, we will talk about the top 10 batsmen of IPL till now. This ranking is based on their runs, strike rate, and total average. 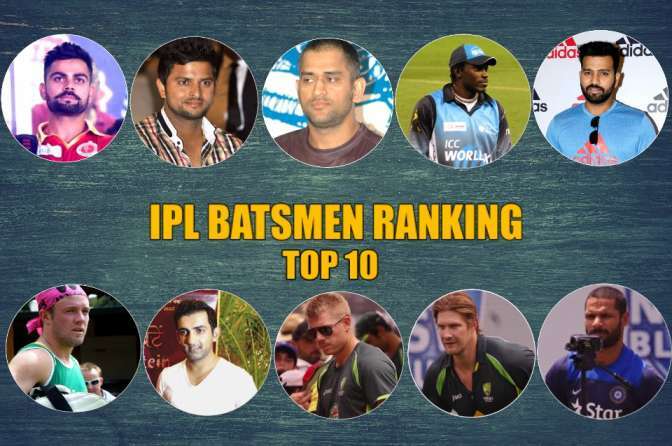 That is the complete list top batsmen in IPL Players Ranking. 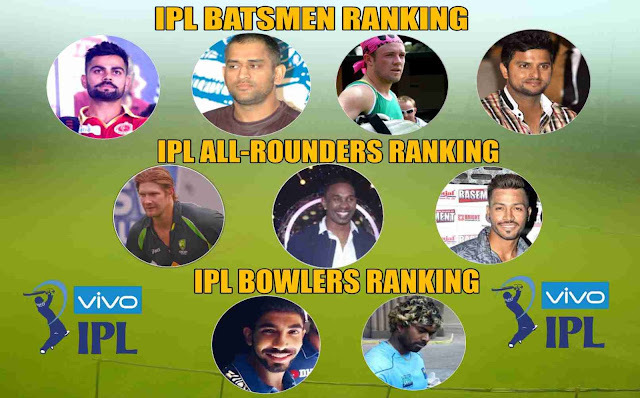 Now let's take a brief view on all players who are on top in IPL Players Ranking. No doubt he is the most deserving person for the spot of the top player in IPL Players Ranking. He is the Run machine. If the team loses all main batsmen but he standstill the last wicket falls down in most of the situations. Even his team may lose a match but he doesn't lose his class in scoring runs. He is none other than our INDIAN CAPTAIN VIRAT KOHLI. He is the man who has been consistent throughout this 11 seasons of IPL and in 11 seasons of IPL, he scored a total of 4948 runs in 163 innings. When he won the U-19 world cup 2008, he was drafted into RCB. Do you know that? Kohli is the only person who never went into an auction. He was drafted in the team. He struggled in his initial years. Right from the time, he was selected as captain in 2012 his bat never stopped the flow of scoring runs. His legend numbers always show it more than that his shots show his top class batting. He has scored 100s-4,50s-34. Want to know Who will win IPL 2019? Suresh Raina is used to scoring consistently for the CSK. He made CSK reach qualifiers every time with the batting skills. He used to be the highest scorer for IPL until last year. Nowadays he is not in his form but in the past seasons he was the most consistent scorer in IPL. Raina is the all-time highest scorer in IPL followed by Virat Kohli. He scored 4985 runs in 172 innings. He scored 100s-1, 50s-35. He played for Chennai Super Kings and Gujarat Lions. He is the best fielder in the IPL, also known for his part-time bowling. So he comes second in the IPL Players Ranking of batsmen. If you are a T20 fan you would have definitely witnessed his storms. His name is enough to create terror in the opponents camp, Christopher Henry Gayle. In the first three seasons with Kolkata Knight Riders, he was not up to the mark. Later He was bought by RCB in 2011. His IPL journey started from there. Gayle scored 733 runs in IPL 2011 season and won the Orange cap for two continuous years. Chris Gayle scored the T20s highest individual score 175 vs Pune Warriors. He has been struggling for his form in previous years. He was bought by Punjab in 2017 and Punjab retained him again. He scored 3994 runs in 111 innings. He hit 100s-6,50s-24. So Chris Gayle in on the third spot in IPL Players Ranking of batsmen. If there is a person who doesn't need any introduction in cricket he is none other than our most lovable AB de Villers, also know as Mr.360. In the list of IPL Players Ranking of batsmen, he is on number 4. I feel no one can hate such a talented man. If the team requires 60 odd runs in 4 overs if AB de Villiers is on the crease then he will make the team win for sure. Ab de Villiers has proven all over the years. ABD has the capability to hit everywhere in the ground. He is known for his hard-hitting and class and talent. He can pull the match in the opponent's hand in minutes. His presence in the IPL made IPL much more beautiful. He had a wonderful stint with Delhi and RCB over the years. He scored 3953 runs in 129 innings. He has scored 100s-3,50s-28. If you ask me who is the best finisher, captain, wicketkeeper? Your questions are two but my answer is one and only Mahendra Singh Dhoni. In the initial years of IPL, he led from the front but he had the role of finisher not a complete Batsmen in the IPL. But later years he moved up the order and scored vital runs for the team and made his place on top in IPL Players Ranking both as a captain and a batsman. He is known for his cool and calmness He made his teammates feel no pressure and worry about the match at the end of the day he makes the team win. MSD played for CSK and Rising Pune. He scored 4016 runs in 158 innings. He is well known for last ball sixes and his helicopter shot was all time favorite for many people. He scored 50s-20. The banned Australian vice-captain David Warner was one of the top performers in the IPL. In his first stint with Delhi Daredevils, he never made an impact on IPL. But when he moved to Sunrisers in 2013 he started showing his class with hard hitting at the end, slog sweeps in the middle overs and wonderful cover drives in the power play. He had led Sunrisers batting unit single-handedly from the past 4 years. Fans missed him a lot in the last IPL season. He has scored 4014 runs in 114 innings Warner won the orange cap in 2017 Season. He scored most no of the fifties along with Gambhir( 36). The next name in the top IPL Players Ranking is Rohit Sharma. Rohit started his IPL career with Hyderabad based Franchise Deccan chargers. His career starting point was the 2007 world cup T20 where he was the member of the world cup T20 winning squad. Rohit had a decent stint with Delhi. He had a hattrick for Deccan Chargers against his present team Mumbai Indians back in 2009. He had a key role when Deccan Chargers won the cup that year. Sharma moved to Mumbai in 2011 season had given a chance to lead MI in 2013 season on the failure of Ricky Ponting. He led the team to cup that year along within 2015 and 2017. He scores run when the team needs him the most. Rohit Sharma scored 4493 runs in 168 innings with 1–100s, 34–50s. This Australian was one of the top Batsmen in IPL history. He was the only player collecting man of the series in IPL for two years ( 2008 &2013). Watson is known for his hard-hitting, he played a key role in Rajasthan winning the inaugural season of IPL. Watson has scored 3177 runs in 117 innings with 50s-16,100s-4. In his 11 years, he played for Rajasthan, Royal Challengers, Chennai super kings. Currently, he is playing for Chennai Super Kings. Watson is on the 7th spot in IPL Players Ranking of batsmen. Gabbar was a continuous performer for his respective team from the starting of the IPL. He struggled in his initial years but later on scored runs from the front. As an opener, he made his spot in top IPL Players Ranking. His notable performance was started in 2012 scoring 569 runs for Deccan Chargers. He has scored 4058 runs in 142 innings with 50s-32. He played for Delhi, Mumbai, Deccan, and Sunrisers. In IPL 2019, he was traded by SRH to Delhi Capitals. So once again he is coming back to his home team in IPL 2019. Though he has moved voluntarily from IPL due to lack of form, he deserves a place here in the top 10 IPL Players Ranking. He is not only a Batsmen but a leader who leads from the back and puts his team top in the table. He is such a generous person who is a more valued person than as a cricketer. When IPL was started he was the leading scorer for India at the time. He showed his class every season. He has scored 4217 from 152 innings He has the record for most fifties(36) along with Warner. He had played for Delhi and Kolkata. We will not see him in IPL 2019. Gambhir announced his retirement from all forms of Cricket. 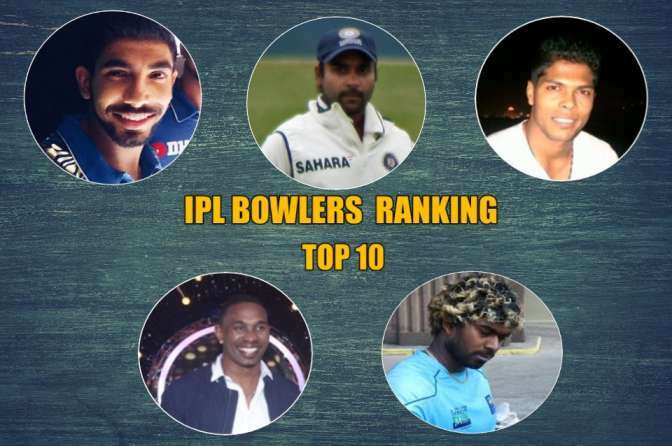 Check all the IPL Players Ranking of bowlers in all seasons. Here I am taking only those players who are playing currently. So that is the complete list of bowlers ranking in IPL. 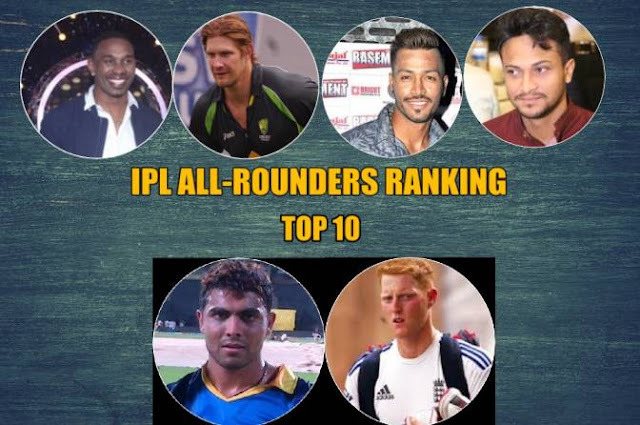 Check below the complete list of All-rounders in IPL Players Ranking. So that is the complete list of All-rounders ranking in IPL Players Ranking list. How is this ranking and what are your suggestions about this list? Write your opinion on Comments.